Q: What is the best fin shape, size, and placement? A: Using 2-liter plastic bottles for your rocket makes the fin size and placement very important. This is due to the large diameter and short length of the bottle. The combination of fins and rocket body are what provide flight stability. Both must be chosen carefully to assure stability. Finally, you may add weight to the nose of your rocket to move the center of gravity farther forward. This should be your last resort to stabilize the rocket as it will reduce the performance. Long and skinny rockets are easier to make stable than short and fat ones. You can lengthen the body of your rocket by stacking a second plastic bottle on top of your rocket motor bottle. A tube made of heavy paper may also be used to add length. This improves the stability by moving the center of gravity away from the nozzle end, and the fins. You want your fins located as far back on the rocket as you can. This provides the greatest stabilizing force from the fins as possible. As a result you may be able to use smaller fins, which would have less drag thus improving performance. 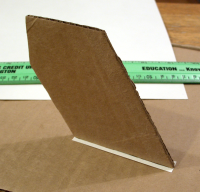 For 2-liter plastic bottle rockets use a fin similar in size to this template. Use a fin ring to mount your fins around the nozzle. Again, this configuration moves the fins farther to the rear of the rocket. Tape the fin ring to the tail of your rocket. Making these changes to body configuration and using a fin ring make the rocket more stable without adding much addition weight. The less weight you add to your rocket, the higher it will fly. If all else fails, you can add weight to the nose of your rocket to achieve stability. NOTE: Adding weight to your rocket makes it more dangerous. Make sure to launch your rockets away from people or property that could be damaged by impact. The safest and easiest way to check your rocket's stability is to do a "swing test." 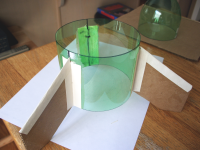 Attach a string to the rocket at its center of gravity. Then, swing the rocket around yourself, holding on to the string, to see if it is stable. If the rocket tumbles and does not straighten out, then it will probably fly badly when launched. Make adjustments to your design, lengthen the body, add fin area, or noze weight, until it no longer tumbles. Now you are ready for a launch!